Is the Moorhen also not a duck? It doesn't seem to have web feet other. Whereas when you look at the bufflehead picture from yesterday his pink feet are all web. 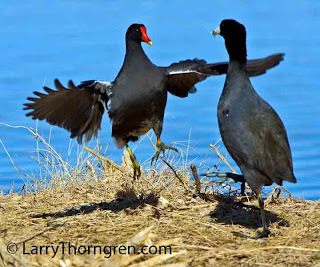 The Moorhen is related to the coot which is related to herons. Both of them have small webs that stick out on both sides of their toes which allow them to swim as well as manuever on land.